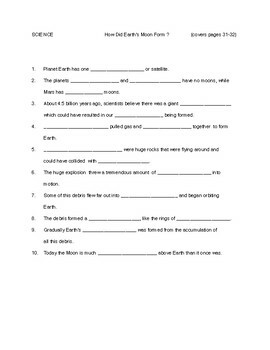 This fill in the blank,GUIDED READING worksheet covers pages 31-32 in the Earth and Sun book. The topic is how the Moon formed. Great resource for homework, classwork, or can used as a study guide. Easy to grade. PART OF A BUNDLE. ANSWERS ARE IN THE PREVIEW.